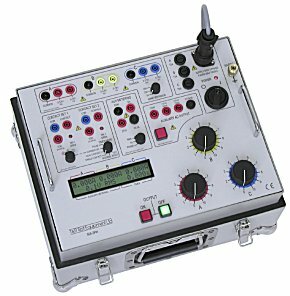 T&R Test Equipment is a market leader in the field of current injection equipment. The range includes secondary injection units with 50 Amp output capability up to 6000 Amps primary injection systems. All have true RMS metering, a flexible timing system, and an easy to understand user interface. The 50A-3PH is a three-phase injection system providing commissioning and maintenance engineers with a flexible system for testing protective systems. It has an easy to understand panel layout and a simple user interface. The status of every function can be seen at a glance, and there are no complex menus to navigate. An auxiliary metering input is provided and can measure voltage, current, frequency, and the phase between any of the current outputs and an external voltage or current. The timing system is very flexible without compromising ease of use, allowing trip times, reset times and closure times to be quickly measured to a high degree of accuracy. Two independently isolated contact inputs are provided, and the timing system may also be used as a stand-alone timer. 0 to 50 Amps per phase output current. Large back-lit Liquid Crystal Display (LCD). 220V 3-phase or 400V 3-phase. 115V to 440V 3-wire supply with optional supply transformer. The unit has a range of outputs allowing injection of currents as low as a few mA and as high as 50 Amps. Voltages up to 18 volts are available on the main outputs. Three true RMS metering ranges are provided, allowing the full scale of the meter and trip level to be set independently of the selected output. Industry standard safety connectors are used on all inputs and outputs for convenience, reliability and safety. Note: The 50A-3PH instrument is supplied with a lead set in a plastic case including 6 x 3 meter 4mm2 output leads terminated in 4mm plugs, 2 x 3 meter, 2 x o.5 meter 2.5mm2 auxiliary leads terminated in 4mm plugs. Supply Requirements: The supply voltage requirements for the unit must be specified at the time of ordering. The unit is available for operation from either a 400 Volt 4-wire 3-phase supply or 220 Volt 3-wire 3-phase supply. The optional delta-star supply transformer allows the 400 volt unit to operate from other supply voltages.